Jordan Sinnott's first half header secured back to back league wins for the first time since August for the Reds, as we scored away from home in the league for the 16th successive time, with a solid away display at Guiseley on Saturday. Billy Heath made two changes to the side with Dec Bacon back from loan to start, Danny O'Brien also started with Richard Peniket back from injury to make the bench. The Reds started the game well with early in-roads from Bobby Johnson as he curled a pass towards O'Brien who got in behind the Lions back-line, Danny's cross was blocked with handball shouts from us waved away. We pressed further with Moyo clearing a dangerous ball from Jordan Sinnott before Josh Wilde's cross was also cleared away. Guiseley were struggling to get out of their own half as Sinnott delivered another dangerous cross towards the far post, Alfreton were pressing well all over the pitch with the hosts restricted early on, Moyo's through ball towards Odejayi on the right wing too long. The game was a tight battle throughout with no clear cut chances, the Lions had their first sighter of goal when a cross from the right from Liburd flashed across the face with Odejayi stretching, Dom Smith was alert to see the cross out. Liburd then won a free kick after being held by Martin Riley, the home fiathful were pleading for a penalty with the foul right on the edge of the box, the set piece was taken short and quick reactions from Sinnott denied the cross in the box. Sam Ramsbottom couldn't hold onto a poked effort from Cantrill which looked to have slipped out of his fingers and went over the bar. The resulting corner was then blazed over from close range by Garner. The contest was very even with the Lions coming back into it after the Reds early control. Johnson fired way wide on 26 minutes before we defended well to block consecutive efforts on the edge of the box. 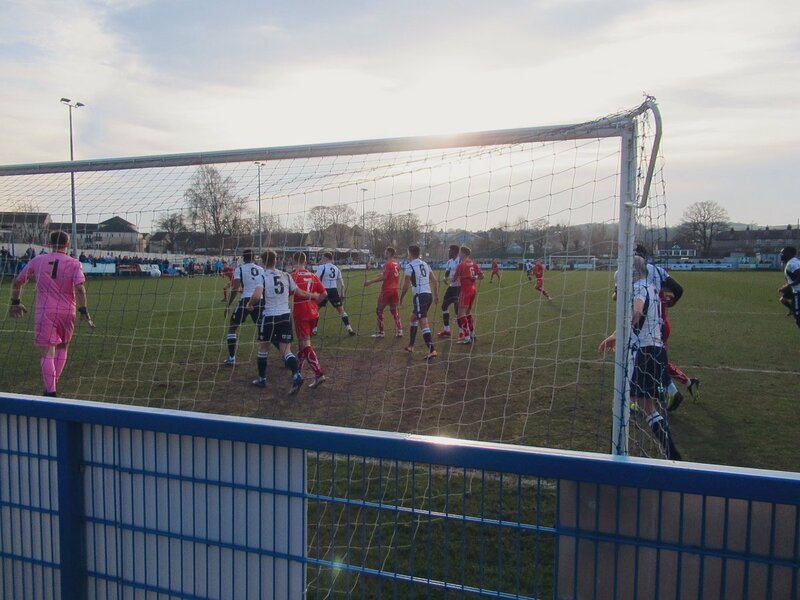 However with 35 minutes gone, Alfreton took the lead with a rapid counter attack from a Guiseley corner which saw Johnson race forward and play the ball wide to O'Brien in the box, Danny's cross was then headed in from a yard out by Sinnott to the delight of the travelling Reds behind the goal. Guiseley responded as Riley cleared off the line after a muddle between Sinnott and Ramsbottom with the ball only being cleared as far as a Lions player with Sam out of position. Liburd then fired over moments later from distance before coming closer with a wicked right footed shot which flew just wide of the far corner. The second half saw an early opening for us as Sinnott hit a powerful free kick over the bar. The Reds midfielder then fired over the bar with a first time effort from Johnson's short corner. Alfreton continued to soak up second half pressure with Heaton's long throws, corners and free kicks all being cleared away in a gradual increased onslaught from the hosts. Smith cleared a cross from Hatfield before we countered with Dec Bacon whose cross narrowly missed contact from Sinnott. Richard Peniket was introduced after the hour mark as Guiseley continued to press but Sam was fouled after a Lions corner before the offside flag went up denying another attack. The Lions then hit the bar after we partially cleared yet another corner, the acrobatic effort had both Sam and Dom Smith on the line beaten but the ball hit the top of the bar before we cleared away. Late expected pressure came with a few scrambles in our box involving former Red Paul Clayton but neither he or Purver could get an effort in, Heaton's next long throw was punched by Ramsbottom before another effort went over the bar in the closing moments. We countered with Tom Allan after excellent hold up play from Peniket but Allan's low effort was saved. Sam denied Purver's low effort before we defended more throws and corners in a tremendous defensively display. But it wasn't to be for the hosts as the Reds recorded back to back league wins in another solid and excellent performance. Alfreton will be looking to make it three league wins in a row on Saturday with the visit of Ashton United, kick off is 3pm at the Impact Arena. ATFCXI: Ramsbottom, Smith, Wilde, Lynch (Clackstone 58), Shiels (c), Riley, O'Brien (Peniket 63), Johnson, Bacon (Allan 76), Sinnott, Hotte. Subs Not Used: Nicholson, Chettle.